Cutis Laxa (CL) is a term that refers to a group of related disorders that feature loose or sagging skin. All forms of cutis laxa are very rare. CL derives from problems with connective tissue, which is tissue that supports, connects, or separates other tissues and organs. Connective tissue is found everywhere in the human body. In cutis laxa patients, connective tissue defects result in stretchy, inelastic skin that may sag and/or be slow to return to its normal position after being stretched. This characteristic is in contrast to Ehlers-Danlos syndrome patients, who also have stretchy skin. In EDS patients, stretched skin generally returns to its normal position after being released. In addition to causing skin problems, connective tissue defects also create internal problems in CL patients. Internal tissues are often weak and unable to support organs. This situation leads to hernias and other problems such as diverticula (a pouchlike protrusion from an organ such as the bladder). There many types of cutis laxa. The NORD report referenced in the link at the right lists twenty different subtypes, and although some of these listings are different names for the same condition, there are still many forms of CL. Overall, however, all of these subtypes fall into two main groups: 1) cutis laxa with involvement of multiple organs, and 2) cutis laxa that causes growth delay and that affects the central nervous system by causing intellectual disabilities, seizures, brain abnormalities, and other problems (b). In addition, at least one form of CL appears to occur in all ethnic groups. In spite of this fact and the number of different CL subtypes, the condition as a whole is so rare that even when all forms are bundled under the name cutis laxa, prevalence is still estimated at only 1 person per 4 million (1). Some forms of CL are inherited and others are acquired. Of the inherited forms, some are recessive, meaning that both parents contributed a mutated gene. Others are dominant, meaning that one parent contributed a copy of a mutated gene or that the mutation occured spontaneously. CL1A is an autosomal recessive disorder caused by mutations in the gene FBLN5. Autosomal recessive means that the syndrome occurs when both parents carry a mutated copy of a gene, and each passes the mutated gene to a child. This condition should be suspected in any very small infant presenting with very loose skin and cardiac or pulmonary abnormalities. The links at the right provides a search for labs that test for cutis laxa type 1A and all types of cutis laxa. Cutis laxa type 1B is most similar to CL type 1B. CL type 1B is characterized by loose skin and systemic involvement (most commonly tortuous blood vessels, narrowed blood vessles, and aneurysms. Patients may also have lax joints and long, slender fingers). CL type 1 can be severe when heart and lung problems (including emphysema) are present. These two conditions are very similar and may be best distinguished by gene sequencing. Treatment is largely the same. The differential diagnosis for CL type 1A also includes cutis laxa, type 2A (CL2A). Unlike type 1A patients, type 2A patients are often born with dislocated hips. In addition, and unlike type 1A patients, type 2A patients do not have emphysema. The two conditions share many other common features, including loose skin, hernias, lax joints, and hypotonia. Sequencing is a method for distinguishing cases that could be either 1A or 2A. Cutis laxa may be confused with Ehlers-Danlos syndrome because of joint laxity and skin abnormalities. However, the skin in Ehlers-Danlos patients typically springs back into place after being stretched, while the skin of cutis laxa patients does not. Hutchinson-Gilford progeria syndrome (HGPS) is also superficially similar to cutis laxa, but CL patients do not have the characterisic faces of HGPS patients, nor do CL patients generally experience hair loss in the way that HGPS patients do. Other conditions in the differential diagnosis for CL type 1A include De Barsy syndrome, gerodermia osteodysplastica, ELN-related cutis laxa, and LTBP4-related cutis laxa. Each of these conditions is described in the Gene Review linked to at the right and in reference 1. 1. Van Maldergem L & Loeys B (2009) FBLN5-Related Cutis Laxa. Updated August 16, 2018. GeneReviews [Internet] Pagon RA et al., editors. Seattle (WA): University of Washington, Seattle; 1993-2019. Full text. 2. do Nascimento GM et al. (2013) Cutis laxa - case report. An Bras Dermatol 85(5):363-365. Full text. 3. Choudhary SV et al. (2011) Congenital cutis laxa with rectal and uterovaginal prolapse. Ind J Derm Ven Lep 77(3):321-324. Full text from publisher. 4. Leily M et al. (2014) Postoperative intussusception in a neonate with congenital cutis laxa and huge hiatal hernia. APSP J Case Rep 6:393-398. Full text on PubMed. Above: Verhoeff elastic tissue staining of a skin biopsy in a CL1A patient. The stain showed collagen bundles [bright red] and adnexal structures [yellow]. 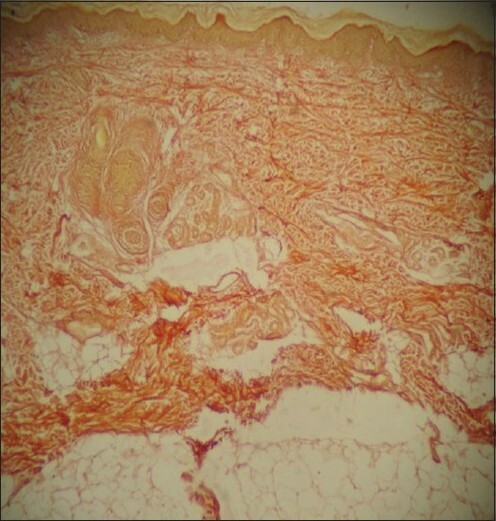 Elastic tissue stain (usually brown or blue-black) was absent. See reference 3. 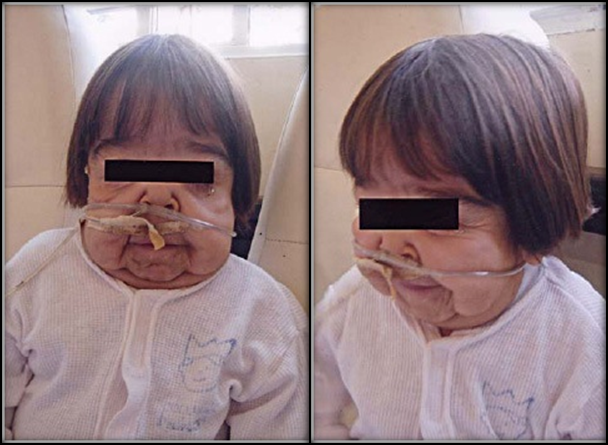 Above: A 3-year-old girl with cutis laxa type 1A. 9 months and had problems similar to hers. See reference 2 for details. Below: An infant with cutis laxa type 1A. Her skin had been loose since birth. She had hernias, respiratory difficulties and a prematurely aged look. See reference 3 for details. Page last modified on 22 January 2019. © 2012-2019 Forgotten Diseases Research Foundation. Valid CSS & XHTML.